Before we go any further, from everybody here at Axess2, we’d like to wish you all a very happy New Year! Now that you’ve had the time to relax, unwind and welcome in 2016 with open arms, your thoughts might have turned to ways in which you can help to improve your workplace. In a large commercial business, or even in smaller establishments, passenger lifts can greatly aid the movement of your employees, guests and customers as well as boosting the value of your business. When you’re looking for the perfect passenger lift for your business, however, what should you be keeping an eye out for? Though the basics of a passenger lift are similar, how they function can be completely different. Depending on your building may depend on which function you prefer- or can have- in your business. Galileo- One of our more popular lifts- the Galileo- is capable of holding 6-8 people at a time, allowing more of your employees and customers to traverse the various levels of your building with ease. Installation depends on how much head and pit room is available though, powered by a single phase MRL electric traction lift, the Galileo is perfect if you’re wanting to save energy. Hydraulic Passenger Lift- Able to withstand carrying 4-7 people in their stylish cabins, our Hydraulic Passenger Lifts are a stunning addition to any business. Their particular smooth mechanisms means that you experience very little vibrations and excess noise from these incredibly flexible lifts. Traction MRL (machine room-less) Passenger Lifts- If you find yourself in a particularly busy commercial workplace, the Traction MRL’s gearless motors are specially designed to withstand heavy traffic movement. Being practical and finding out what exactly makes your passenger lift tick is one thing, making sure the overall appearance of your lift fits in with your businesses design and style is another. No matter what people say, appearance really does matter, especially if you’re trying to sell your business’s best bits or make it more appealing to your customers. 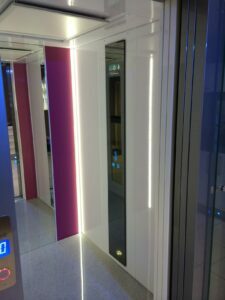 To help you keep your business’s aesthetical appearance uniformed and professional, we offer a bespoke design service which allows us to create your passenger lift to your specific requirements. Here at Axess2, we want to make sure your lift is installed and fully functioning throughout its life, that’s why we supply, install, maintain and repair your lift for complete coverage. Our installation process if quick and requires minimal maintenance, meaning you’re able to carry on with your work with very little disturbance. For more information about our expert passenger lifts, don’t hesitate to contact us on 01200 405 005 today or follow and like our Facebook, Twitter, Google+ and YouTube pages for our latest news and updates!